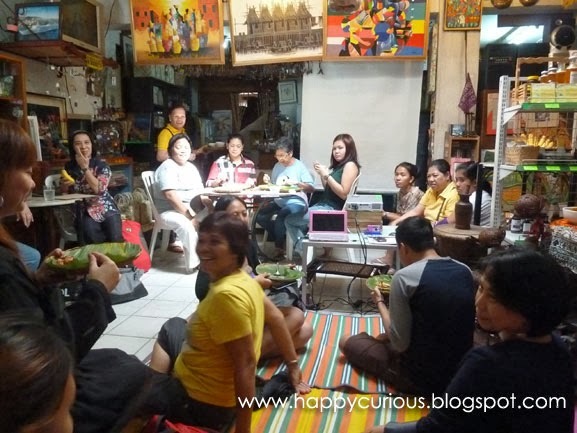 Still from the things I learned in last year's 1st Health Bloggers Meet - Kapit-bisig para sa Kalusugan Pangkalahatan: Iulat, Ipahayag, at Isulong, a collaborative effort of The Philippine Health Bloggers Society, International Youth Council Pilipinas and HealthActivist.ph. In my previous post, I shared what I learned about our health care system and what we can do to support efforts to make it better. One of the things that we can do is to start eating healthy so we prevent illness and the need and cost of availing hospital services. The other thing we can do is to learn about other healing modalities aside from Western medicine which is what we are getting from our traditional physicians. And of course, we need to support efforts that seek to better our current health care system just like SARILAYA is doing. So to start the change from ourselves and our households, eating healthy is the simplest ways to promote health and healing of ailments. Another speaker in the event, Ms. Esperanza "Pangging" Santos, Coordinator of Integrated Health Development Program (IHDP) for SARILAYA, gave us some insights on how to have a healthy lifestyle starting with what we eat. There was a cooking demo afterwards featuring Vegan Pinakbet. Here are some of the thing she shared with us in her presentation. She mentions that 30-40% of our food intake should be raw such as salad or kimchi, or half-cooked veggies (steamed or blanched). Water therapy is also important for cleansing and we need more than 8 glasses; we need 14 glasses throughout the day! Put a pinch of salt in the water for added benefits. If you are a tea and coffee drinker, she recommends herb tea made from fresh leaves of herbabuena, tanglad, pandan and others. The best coffee is brewed, mushroom coffee or chocolate without milk is also a great morning drink. For a healthier lifestyle, make sure you exercise daily. 30 minutes of walking is good as long as you move. Indulge in breathing exercises as you walk and do it in a place with many trees so get fresh air. Walk in sunshine to get our vitamin D. The best time is from 6AM-10AM in the morning or 4PM-5PM at noon. Adequate rest should be observed. Make it a habit to sleep before 10PM and wake-up before 6AM. Of course, practice temperance. Strive to attain balance in all aspects of your life including your relationships, work, family and other activities. When we don't feel well, we can resort to healing shortcuts first before consulting a doctor. These include cold ice compress, hot compress, acupressure, acupuncture, therapeutic massage, daily sunshine, sauna baths, laserlight therapy, zapper, nuga bed, herbal compress or herbal massages. Following these guidelines, our main goal is to be healthy in mind, body and spirit. This should help us to improve not only our health and our lifestyle but other aspects of our life as well. After all, when we feel good, we are also in a better place to do good for others. Thank you for reading the article. I will try my best to keep on writing about health and healthy living.